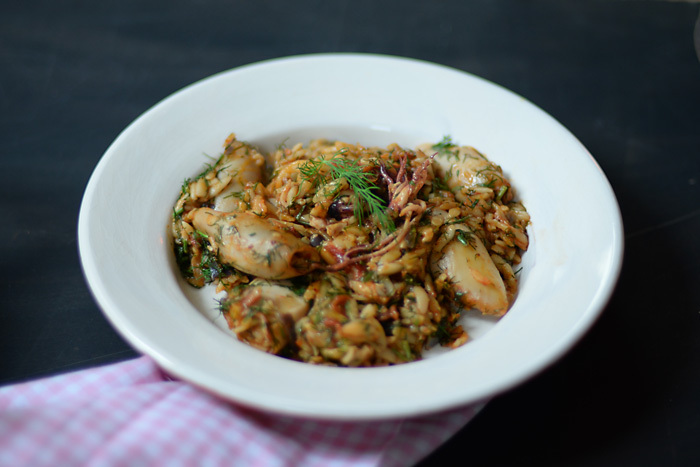 Lemon & Vanilla: Greek squid and orzo / Lulas com orzo à grega. 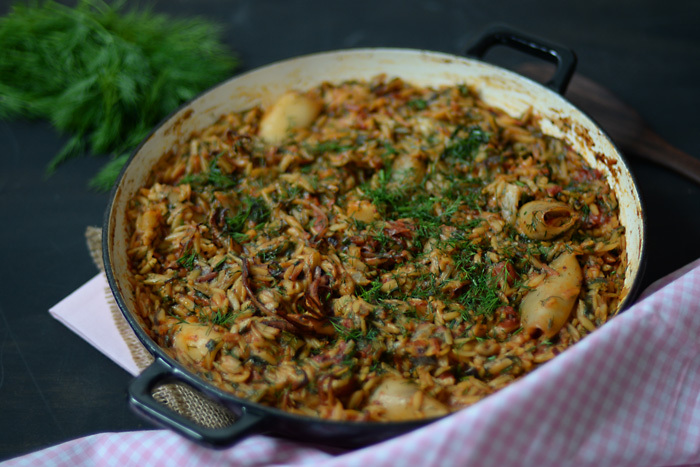 Greek squid and orzo / Lulas com orzo à grega. 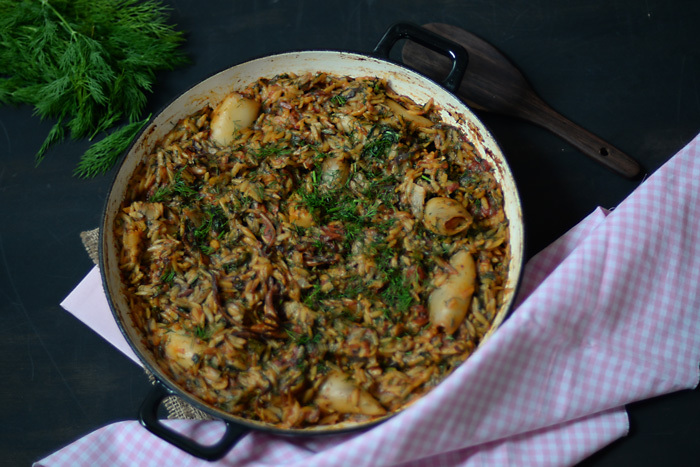 Although I love both, I never thought of putting them together, specially with such a great amount of dill but, saying that, we all were delighted and positively surprised with the amount of flavour in this one pot, slow cooked dish. 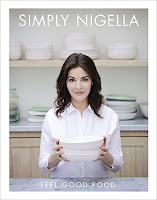 Easy to prepare, this recipe from Nigella's new cook book "Simply Nigella" got lots of compliments and was truly appreciated around the table. Put the olive oil in a large ovenproof shallow casserole over a low heat. Add the onion, fennel, garlic, squid and squid tentacles and cook for 10 minutes, stirring from time to time. 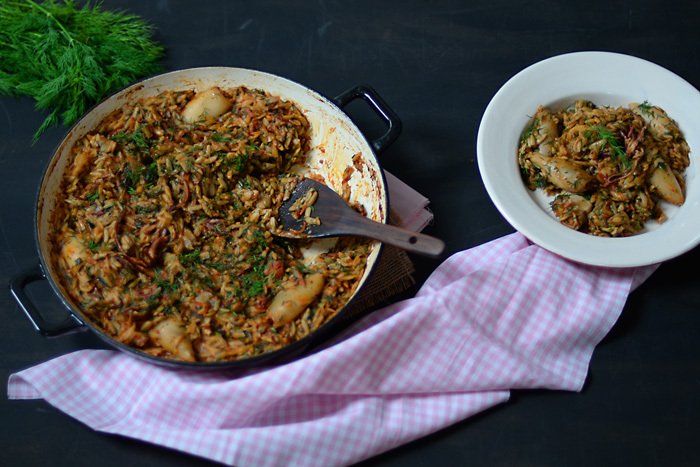 Stir in the orzo pasta and the chopped tomatoes. Add the tomato purée to the empty tomato tin, then fill with cold water and give it a good stir, before pouring this into the pan. Pour in the Ouzo and give everything another stir. Turn up the heat, and once it comes to a bubble, clamp on the lid and transfer the pan to the oven. Cook for 1 hour and 20 minutes. After that time, take the pan of the oven, remove the lid, add the boiling water and stir well to scrape up any bits stuck to the bottom of the pan. Add salt and pepper to taste and most of the chopped dill. Stir and put the pan back in the oven, without the lid, for 10 minutes. 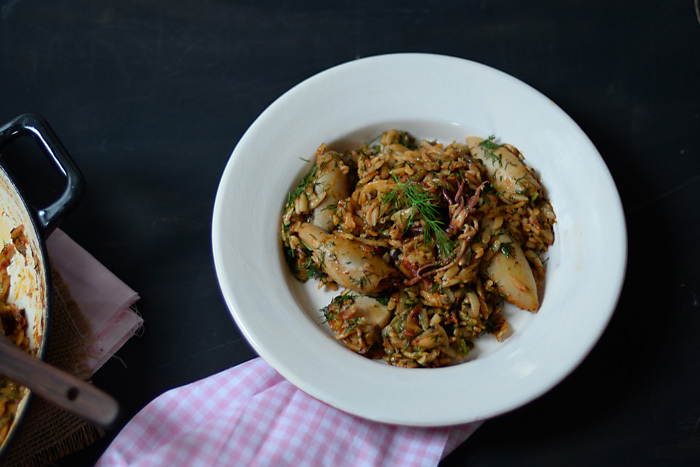 Remove the pan from the oven, sprinkle with the remaining dill and serve. Embora ame ambos de paixão, nunca me lembraria de os juntar no mesmo tacho, mas o certo é que a combinação resulta na perfeição e ambos, em conjunto com a enorme quantidade de aneto que leva, fizeram de um almoço de Sábado, uma refeição memorável e a repetir! 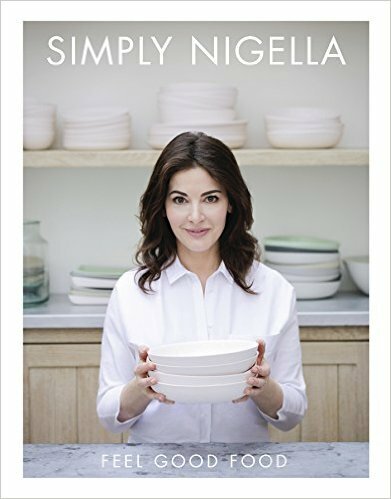 A receita é do novo livro da Nigella "Simply Nigella" e embora não me tenha chamado a atenção quando folheei o livro, captou-a de facto e de imediato, quando vi a Nigella cozinhar este prato no programa de apresentação do livro. Aquecer o forno a 160ºC. Colocar o azeite num tacho baixo mas grande o suficiente para lá caberem todos os ingredientes e que tenha tampa e possa ser usado tanto no fogão, como no forno. Adicionar a cebola, os alhos, as lulas e seus tentáculos e o funcho e cozinhar por cerca de 10 minutos, sobre lume baixo, mexendo de vez em quando. Adicionar a massa e o tomate picado e mexer tudo muito bem. Colocar o concentrado de tomate na lata vazia, encher a lata de água fria, mexer bem e despejar o seu conteúdo para dentro do tacho. Adicioanr o Ouzo ou Vermute e voltar a mexer. Aumentar o lume e quando a mistura levantar fervura, tapar o tacho e colocá-lo no forno pré aquecido. Cozer por cerca de 1 hora e 20 minutos. Passado esse tempo, retirar o tacho do forno, juntar a água a ferver e mexer bem, raspando todos os bocadinhos que estejam agarrados ao fundo do tacho. Temperar de sal e pimenta a gosto e adicionar a maior parte do aneto picado, mexendo tudo muito bem. Voltar a colocar o tacho no forno, desta vez sem tampa e cozinhar por cerca de 10 minutos. Passado esse tempo, retirar o tacho do forno, polvilhar com o aneto restante e servir. Etiquetas: Dill / Aneto., Fish / Peixe., Nigella Lawson., Orzo., Ouzo., Pasta / Massa., Simply Nigella., Tomatoes / Tomates. Lorraine Pascale dad's lasagne / A lasanha do pai da Lorraine Pascale. Chaja Peach Meringue Cake for the Sweet World / Bolo Chaja com Pêssegos e Suspiros para o Sweet World. Lemon and vanilla crème brûlée with fresh mango / Crème brûlée de limão e baunilha, com manga fresca. Hot Cross Buns, Easter and the Sweet World / O Sweet World, a Páscoa e uns Hot Cross Buns. Pecan Pie / Tarte de Nozes Pecã. © Copyright 2016. Created by JLDesign.